It's late in the day, but it's still officially 2013 here for a few more hours. You'll all be up till midnight anyway right? It may be the old age or this terrible cold I've caught talking, but I'm actually looking forward to going to bed somewhat early. Gotta start the new year out right- well rested and ready to sit around in my pajamas for one more day before starting another crazy year. But first we franken! 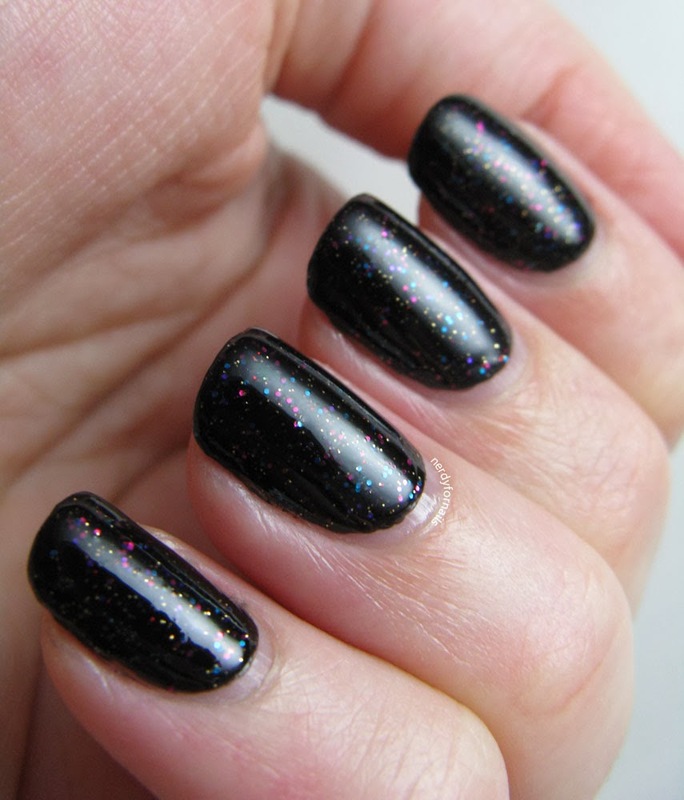 Tonight I've got my attempt at duping the popular Butter London shade Black Knight. 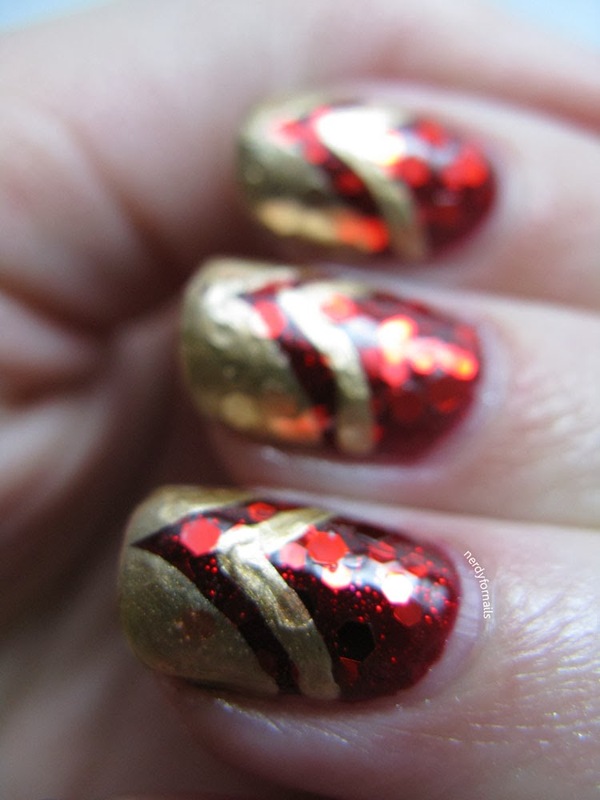 I mixed roughly 1/3 black, 1/3 Jewel Tone and then the last third was the red and gold glitters. 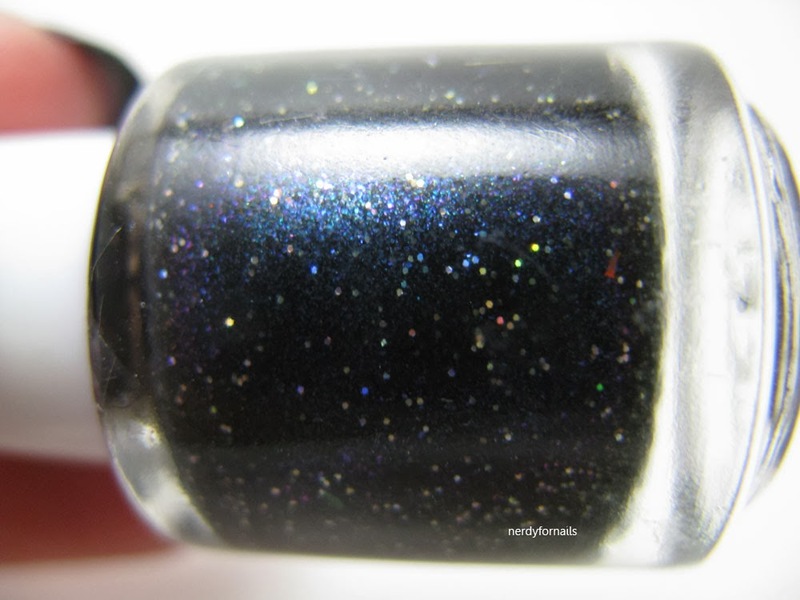 I found Jewel Tone at my Dollar Tree and thought it looked a lot like the glitter mix in Black Knight. I'm compulsively cheap and don't think I own a single polish that cost over $8 so of course I had to try to try to dupe Butter London. That also means I don't actually own any BL so I had to do some research on the internet instead. I loved Scrangie's review and swatches of the shade. You can see her post here for comparison. 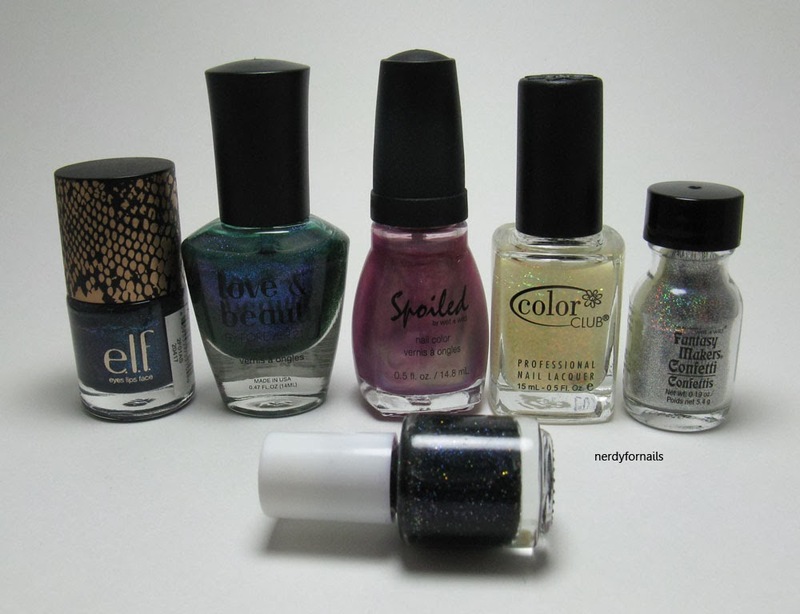 Overall not a horrible dupe, the color mix is about right but mine is too light on the glitter density. I suspect this is hard to control when mixing existing glitter polishes rather than actual glitter. I'll call my version Blacker Night since that's accidentally how it turned out. Not perfect by any means, but I have a lot of fun frankening and couldn't resist trying this one out on the cheap. I'm back as promised with my second franken. I must have gotten lucky because I'm blown away by this polish. I've worn each of the polishes in this franken alone and in a few different combinations, but I've never been so impressed by them before. 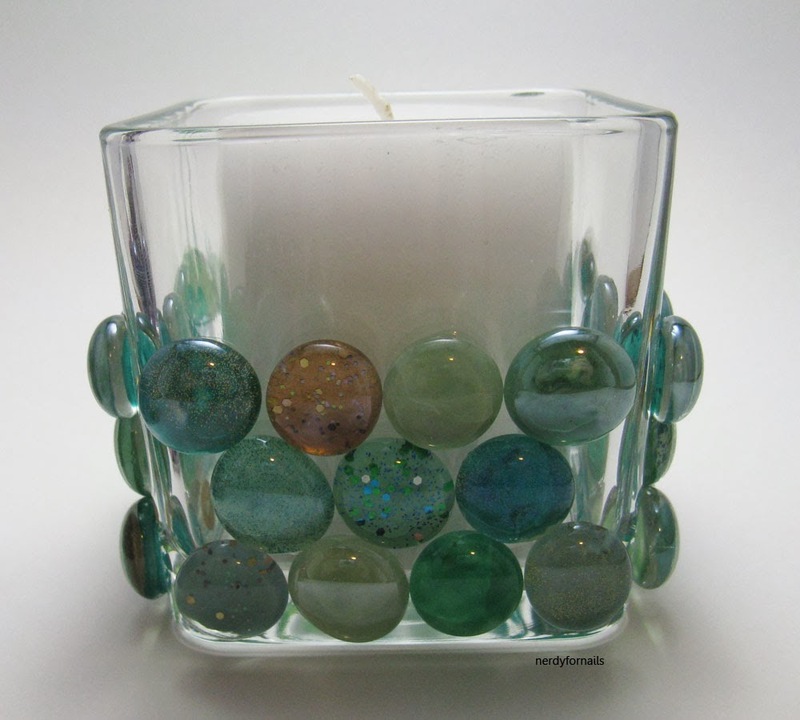 I stumbled upon this recipe for greatness while painting glass gems for my candle holders. I put sheer toppers on several gems and went back later with darker polishes to finish them off and one combination happened to be e.l.f. and Love & Beauty. It was gorgeous and the shift was amazing. I knew I had to franken them! 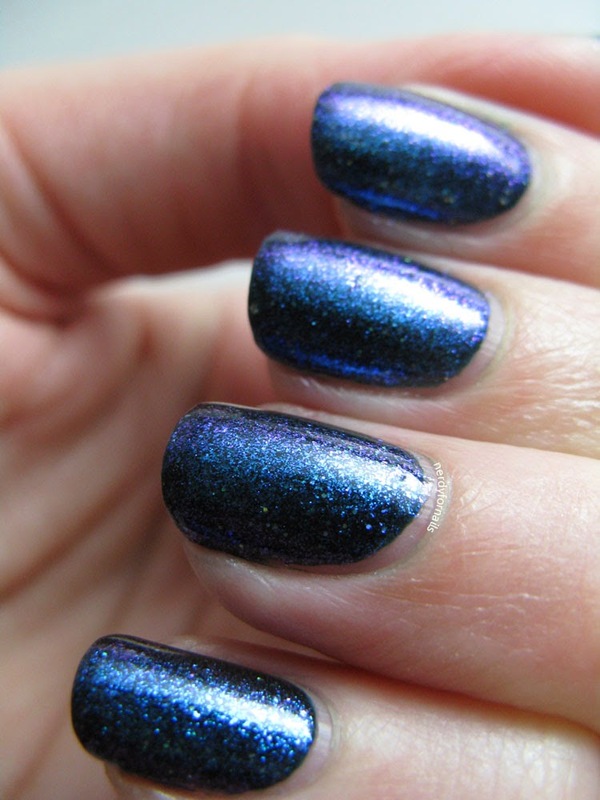 Both of these polishes have a slight purple shift on their own, but neither show up very well outside the bottle. I mixed in a few other things and came up with a little polish I like to call Sparkleverse. e.l.f. : Unnamed polish. It just says 20147 on the label. I got it from Target at Christmas last year. The shift is still a bit hard to capture, but I think I got it there on the pinkie. The best part is the wear time on this polish. I was really disappointed in the e.l.f. polish by itself. The last time I wore it there were chips within the first day. I've had this franken on for four days now and there isn't even noticeable tip wear. If you've got any e.l.f. polishes lying around that you haven't been using because of chipping (or smell) issues making a franken may be the perfect solution! Tomorrow's franken is a dupe of a popular Butter London polish. Can you guess which one? There are just a few days left until the new year and I wanted to show off some "new" polishes that I made recently. I've got two so far. Let's see if I can find some creativity to come up with a third so I can post one for each day until New Years. My first franken is a case of it didn't come out how I pictured, but who cares this thing is gorgeous! 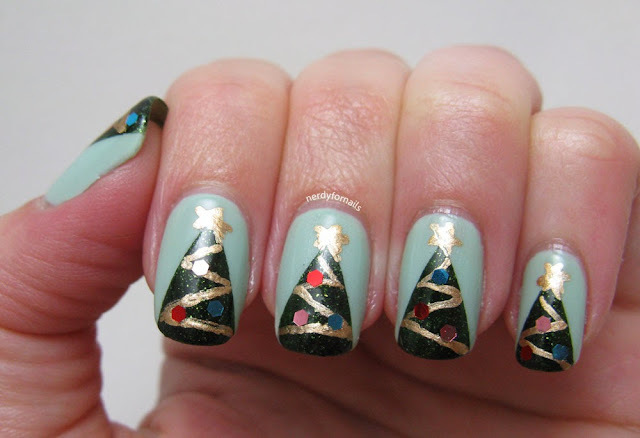 This franken idea came out of my hatred of pale/baby blue, and strangely inexplicable love of all shades of teal. I started out with the Milani 3D Holographic on the left. It's pretty, but just the wrong shade of blue for me. 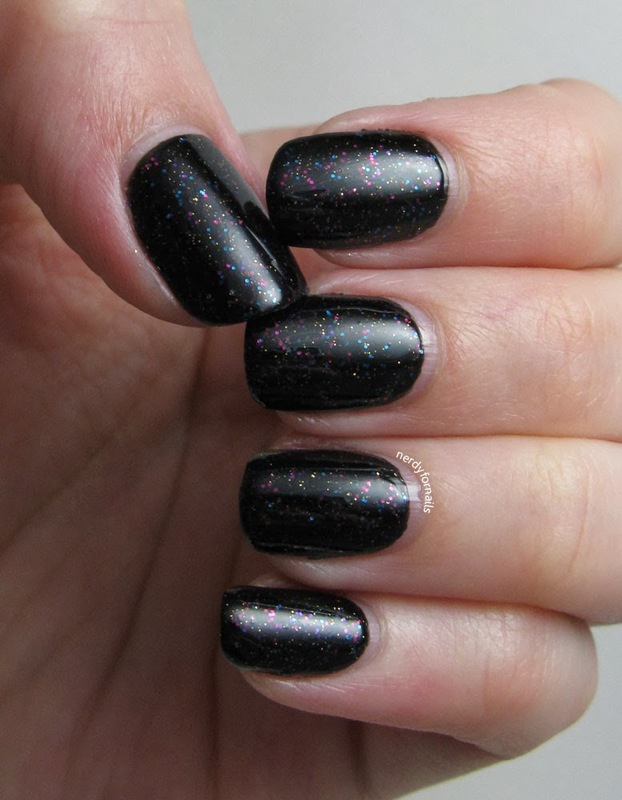 I wanted to see if I could darken up a holo without losing the effect. The answer turned out to be not really (at least not with the supplies I have available). I think the main problem is that the Milanis are scattered holos rather than linear so the effect wasn't as striking to begin with. 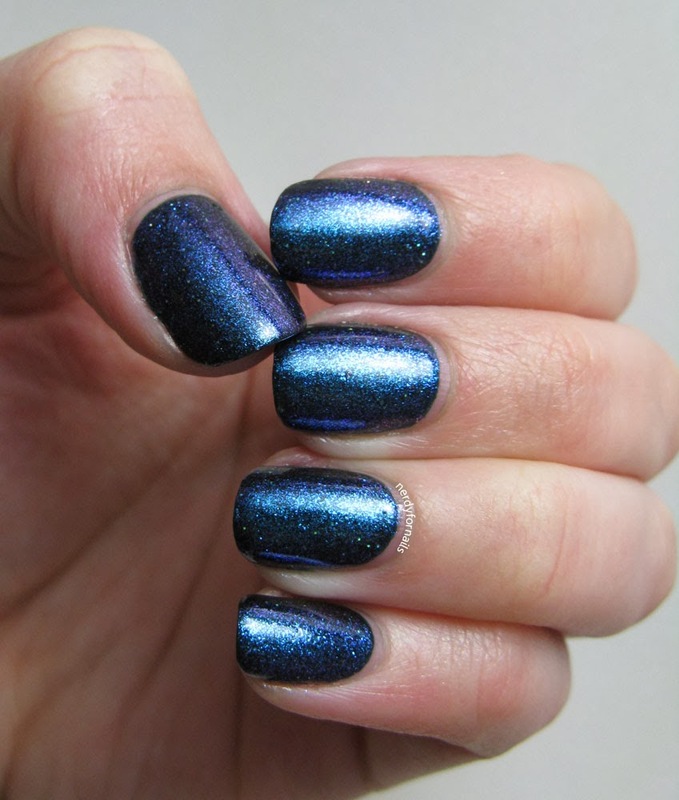 I mixed in fairly equal parts of everything shown below and came up with this super shiny teal with subtle holo shimmer. Left to right- Milani 3D Holographic, Cyberspace; Color Club, Sky High; Sinful Colors, Endless Blue; Color Club, Harp On It; Island Girl, Aloha Paradise; Spoiled, Distant Memory; Milani 3D Holographic, HD. Check back tomorrow for another franken creation. I can't believe this! I knew it was coming up soon, but didn't realize that today was the day until I looked back at my first post. Lucky catch huh? 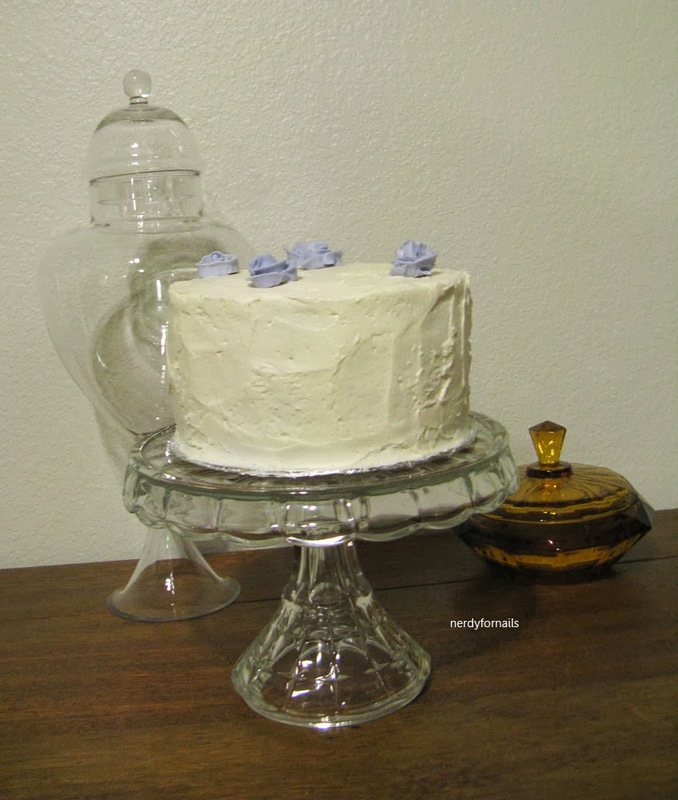 I'd feel terrible if I forgot my blog's birthday. 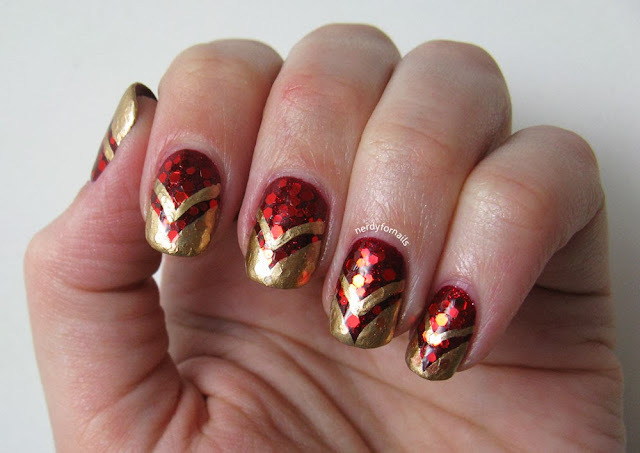 I'm going to celebrate by taking a look back at my 10 favorite manicures/posts of... all time. I also want to say thank you to everyone who's read/commented/chatted with me this first year. It really means a lot to me! 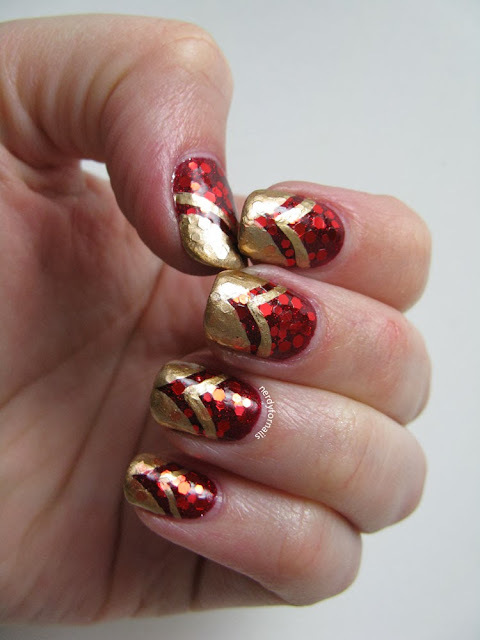 Blogging can be tough sometimes but the love of polish and support from all you wonderful ladies keeps it fun. *Disclaimer- this is much harder than it sounds. I ended up picking 25 posts that I had to narrow it down from. There are so many that I loved, but I ended up choosing posts from milestones in my year that were important to me. I hope you enjoy! If you have a favorite I didn't mention let me know. I had just started using my light box and I was super proud that these turned out almost as good as The Nailasaurus who is a blogging and striping tape goddess. I don't love some of my earlier work, but I still think these look great from only a month into my blogging career. 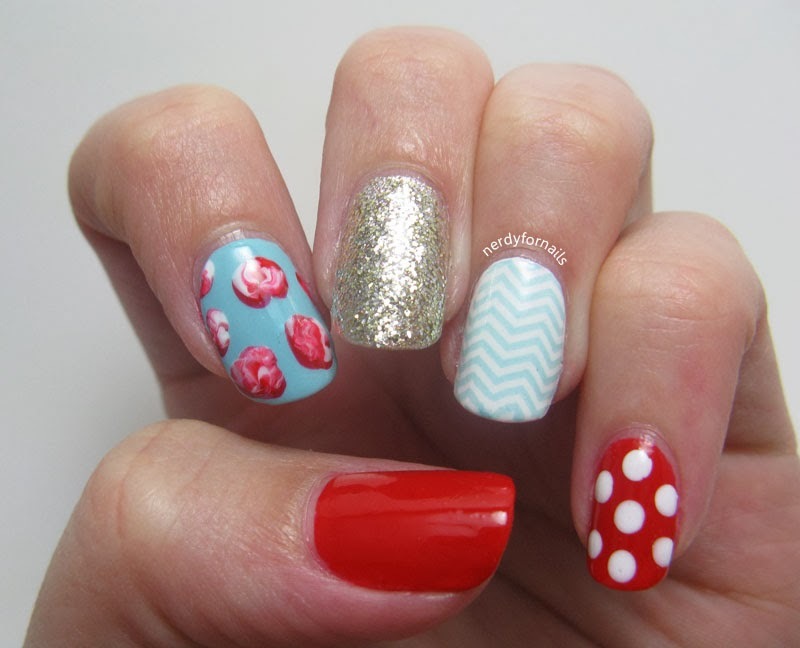 I call these my Pinterest nails. They just look like the kind of nails I see pinned to so many boards. I love the colors and patterns together which doesn't always happen when I do skittles. With Christmas right around the corner I've been looking for some easy handmade gift ideas. 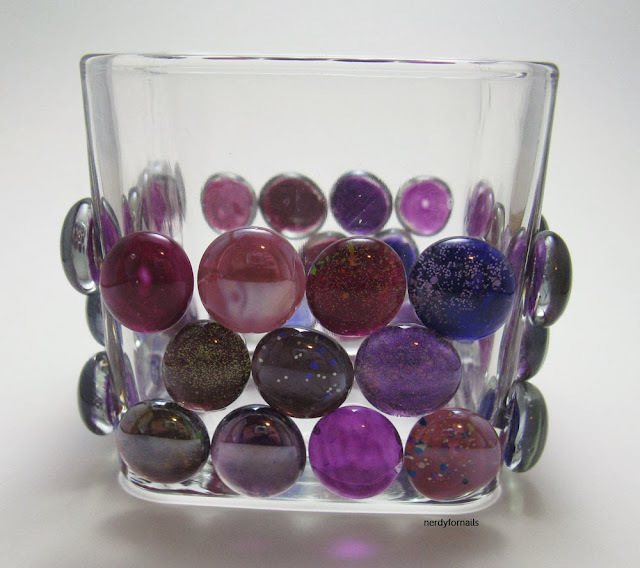 I had picked up a bag of glass gems from my local Dollar Tree a few weeks ago and I thought they'd be perfect for decorating votive holders. My Dollar Tree has a pretty good selection of candles and votive holders this time of year so I was able to get those for a dollar each too. 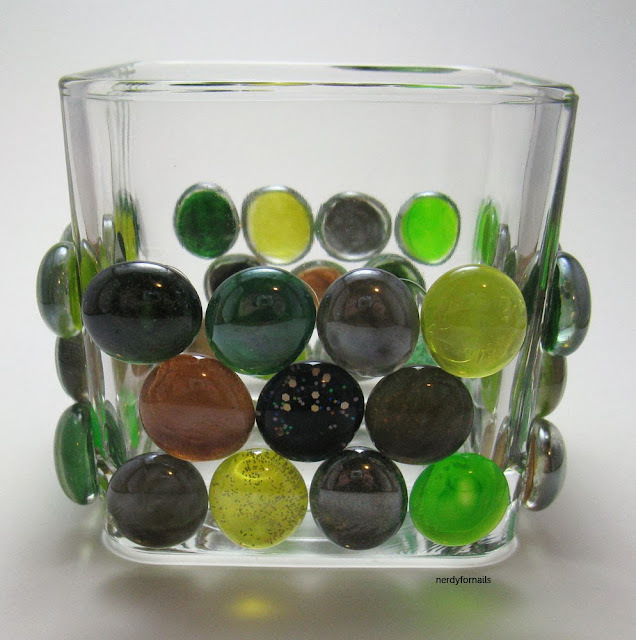 I ended up using almost two bags of the glass gems for three candle holders so this whole project only cost $8. I had a lot of fun making these and hope the recipients love them too. 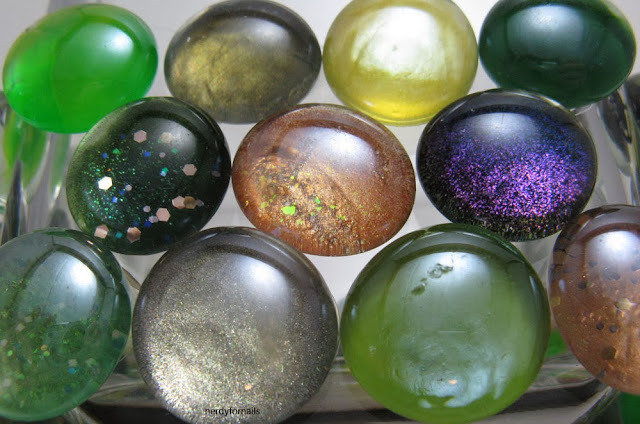 All the different combinations were so fun to discover as I flipped over the finished gems. 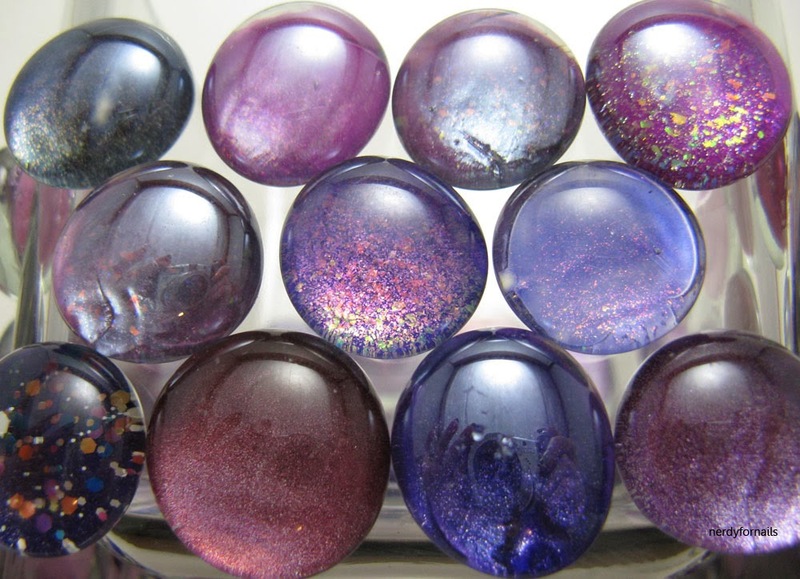 I used a clear glue meant for gluing glass to attach the gems after they had dried. 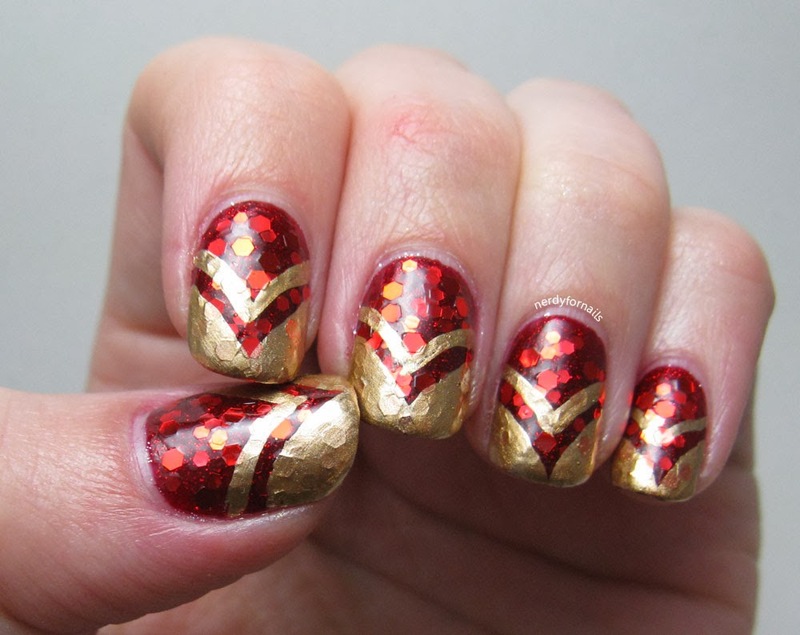 What other nail polish crafts have you guys tried? I'd love to see links in the comments if you have something cool to share. Hello nail friends. 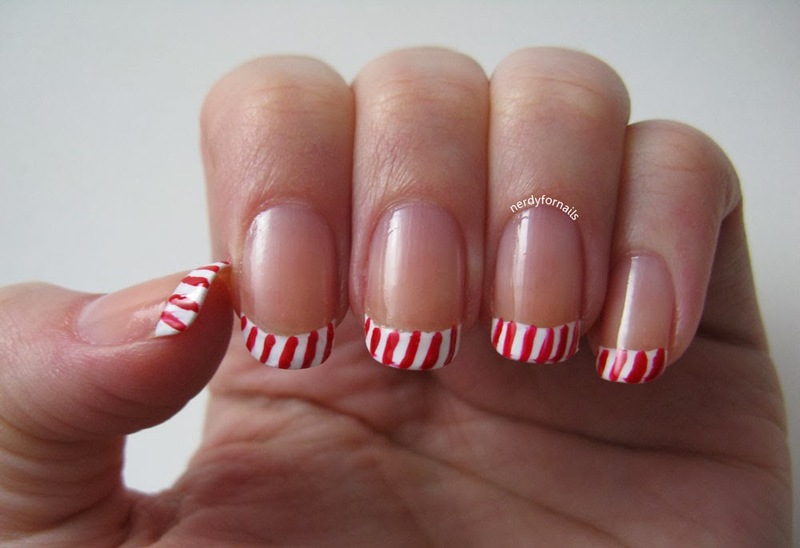 How are your holiday preparations going? We finished the last of our shopping yesterday (you know, getting it done early this year). It seems harder to get in the Christmas spirit every year. It's just always so busy with work and baking and seeing five different sides of the family it's easy for me to get burned out. 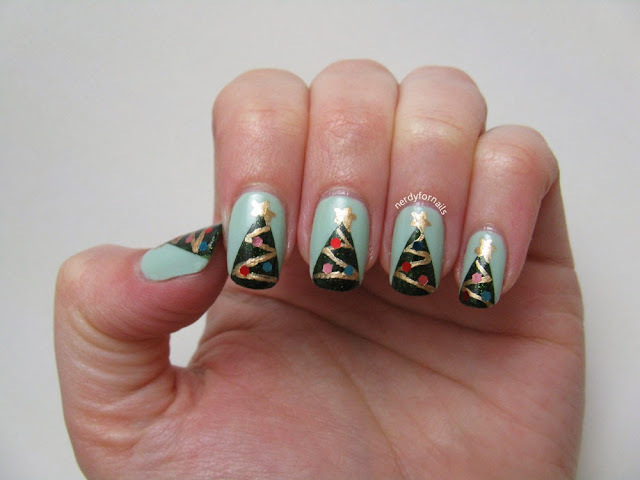 I've been wondering what are your favorite Christmas traditions or things that help you get in the holiday mood? My favorite tradition from childhood is St Nick putting candy in your shoe every Sunday morning in December before Christmas. But only if you leave you shoe by the front door cause St Nick ain't got time to go looking for your shoe all over the house. We also learned that it doesn't do any good to try to trick him by leaving two different shoes. St Nick is smarter than he looks. I tried this tradition with my husband last year, but he kept putting away all the shoes! I guess St Nick also doesn't buy my excuses about why shoes need to be left out instead of going into the closet where they "belong." I've got on two coats of Orly Jealous, Much? as my base. 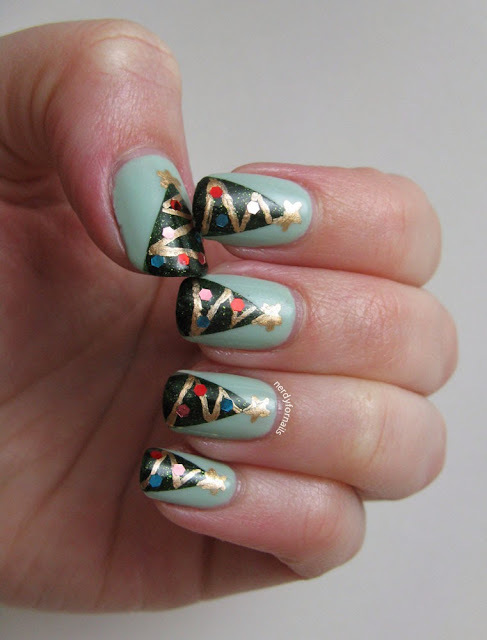 For the trees I taped off triangles and then sponged on the darker green, Revlon Colorstay Rain Forest. 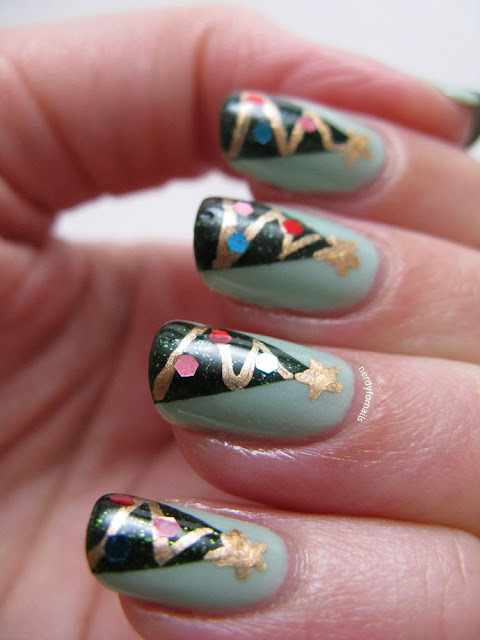 I used a small brush and Maybelline Color Show Bold Gold for the stars and garland detail. The ornaments are glequins from Born Pretty. These were really easy to do if you're looking for a last minute nail idea. I've been saving this polish for the appropriate time of year and I think it's finally arrived. 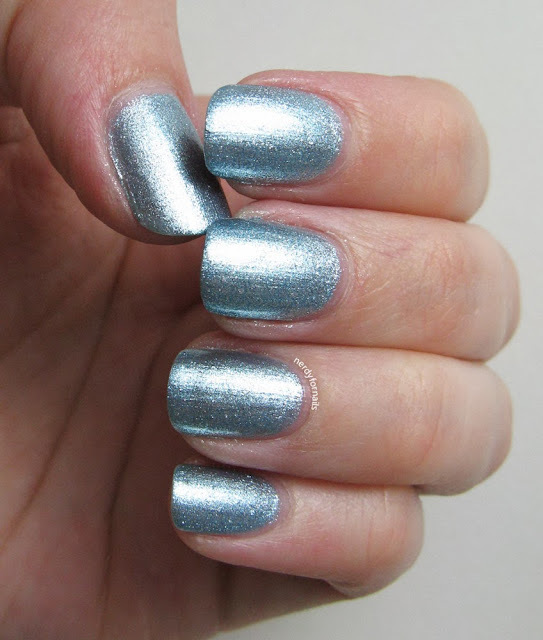 This is one of the Kelly polishes I got in Thailand and it's a very frosty blue foil. It's gorgeous.. and I hate it. There's nothing wrong with the polish at all. The formula was good and it had nice coverage in two coats with minimal brush strokes but I almost always dislike pastel polishes on my own nails (they look great on everyone else). I also really don't like the color blue. As far as colors go it's my 4th least favorite. 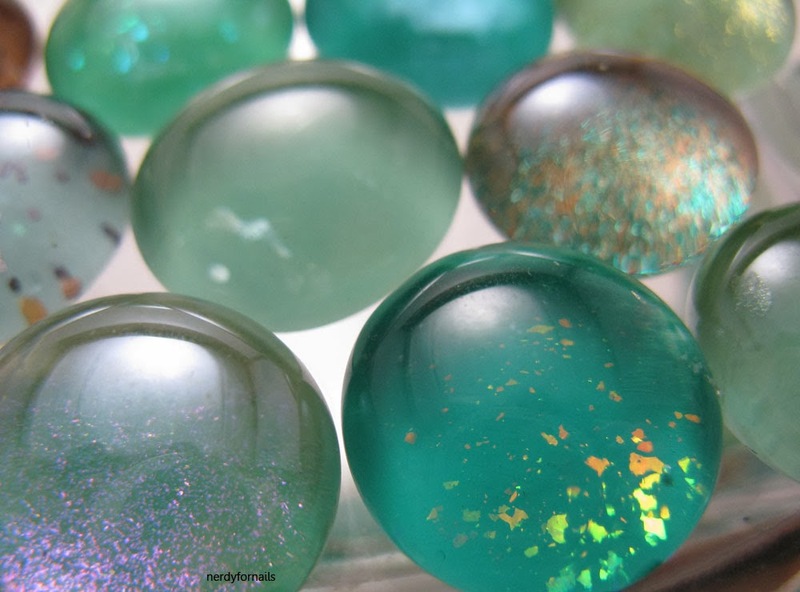 Teal, turquoise, robin's egg, navy- great! But if it's a pale, pastel or medium blue then I don't want anything to do with it. I'm also really curious why colors that look great to some people look awful to others. The human brain is a complex and mysterious thing! Here I added a coat of a gorgeous franken that I won from a giveaway from Franken Femme a while back. 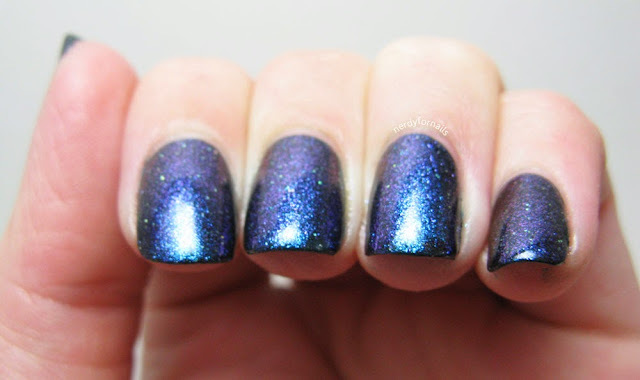 It's some kind of amazing holo flakie concoction that I really love. I think it adds to the frosty effect. I'll definitely be showing more of this polish later. Annnd stamping. This is Bundle Monster plate 323 and LA Colors white. I got a new XL squishy stamper and I love how it wraps around the nail completely but I'm still having trouble figuring out which polishes work with it. I have several white polishes that the stamper refuses to pick up. I'm disappointed that this one isn't very bright against the background, but my thicker whites weren't working. More experimenting is definitely in order. 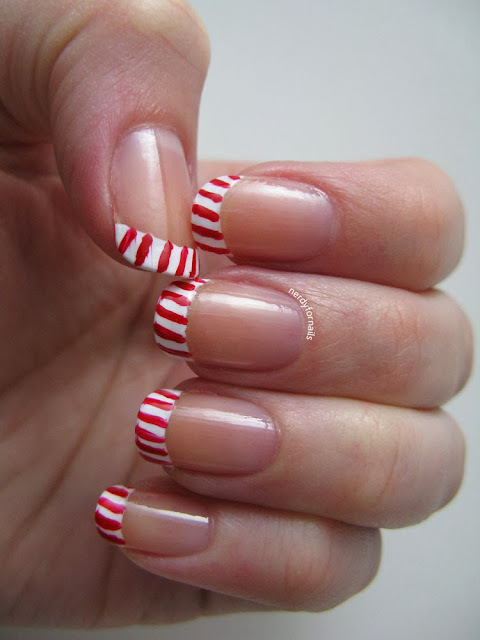 My birthday is this week and I'm taking a break from Christmas nails to do something that's more "me." I'm not sure exactly what side of me this is because I would normally paint something like a unicorn puking glitter, but this feels right too. 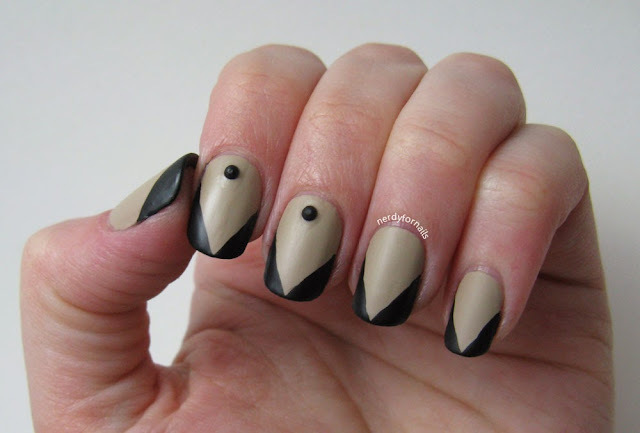 I've found myself oddly drawn to the look of stiletto nails lately, but not so much that I can actually see myself filing down my own. I think I'll just fake it every now and then by painting on pointy tips. When I envisioned these in my mind they were matte, but as usual I can never leave well enough alone so I also have a shiny version. Which ones do you like better? 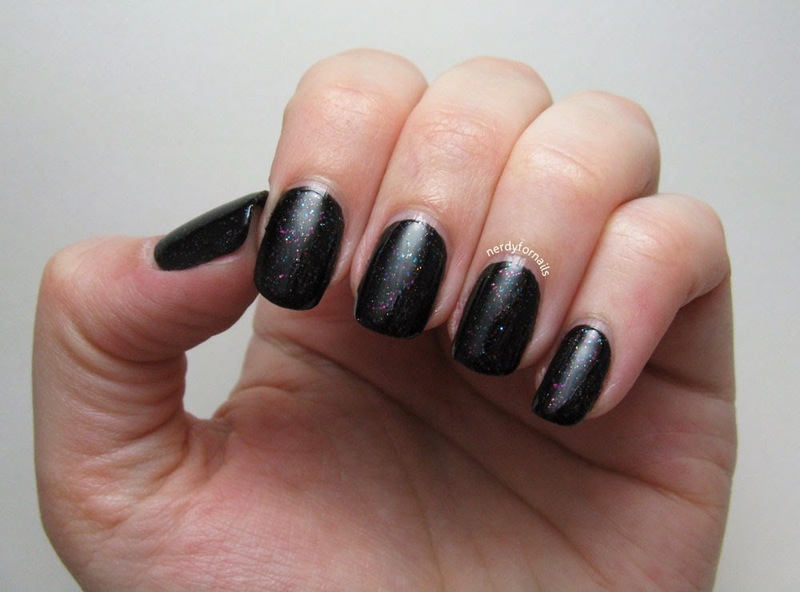 I love that the black rhinestones look like tiny buttons on my fingers. Random fact #582- I absolutely love buttons and sometimes can't resist buying jars full at antique stores. I've got on two coats of Spoiled, Only in Creams. 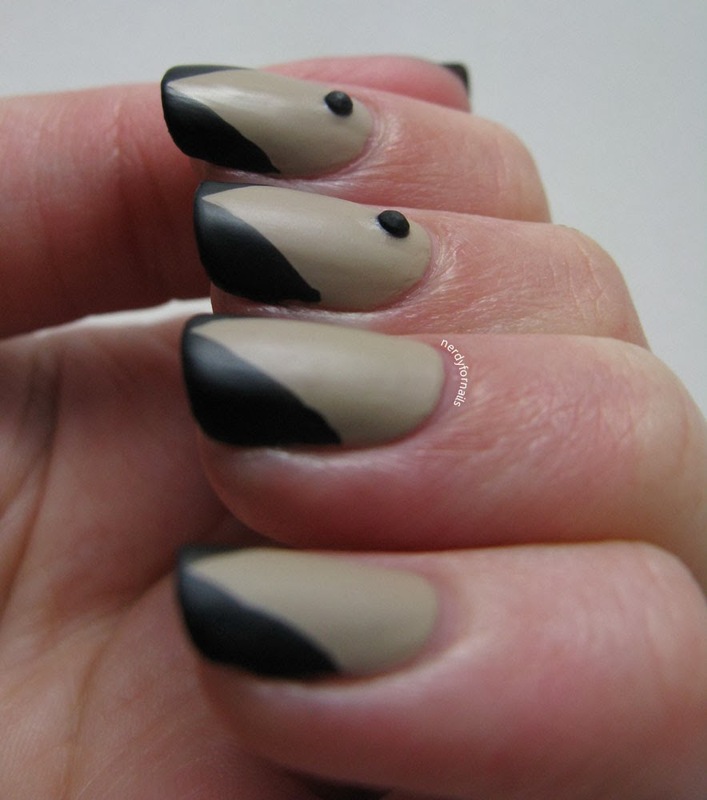 I used the brush from the bottle of LA Colors, Black to freehand the tips. I'm pretty impressed they came out as straight as they did. I added black rhinestones from Born Pretty and finished it off with NYC Matte Me Crazy and then later Sally Hansen Dries Instantly. And of course there was birthday cake. I call this Chocolate Chip Cookie Dough Cake. 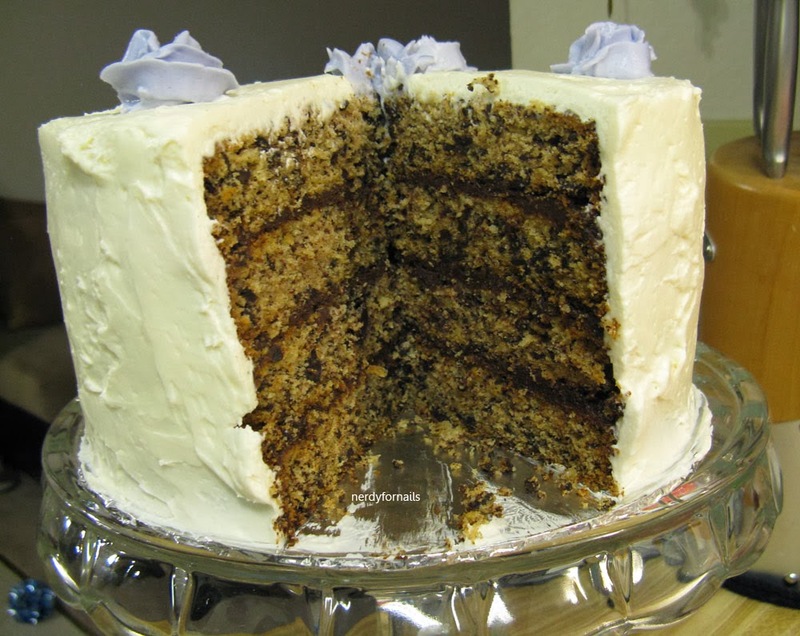 I combined a couple different recipes I liked to make one super mega extra delicious cake. Words go here right? This work week has officially turned my brain to jelly and it's not even over yet. It's finals week at the university where I work so the stress level is higher than usual and I'm not even the one taking the tests. My deepest sympathies to those of you who are in the middle of all that fun. I graduated about seven and a half years ago now and the amount of times I've missed being in school is exactly zero. I've got another set of Christmas nails for you today. I wanted something extra glitzy this time like lights and ornaments all smushed together. I really love how these came out. The glitter catches the light when I move my hands and they feel so festive. 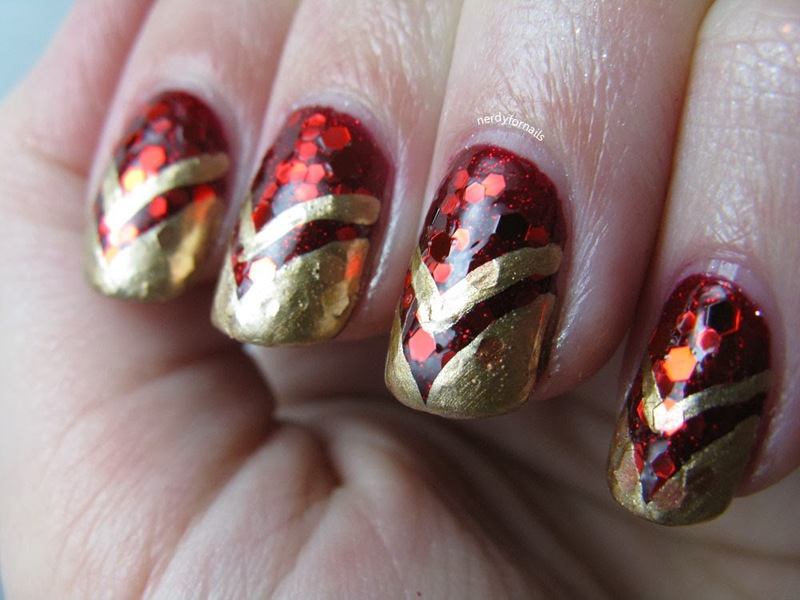 I started out with two coats of Finger Paints, Romanticism Ruby which is a nice red jelly packed with red micro glitter. Next I dabbled on a generous coat of Milani Jewel FX in Red for some larger glitter. The Milanis have some great coverage for being such a chunky glitter, but it's never enough so I also added individual pieces of loose glitter that I got from Born Pretty to the barer spots. At this point I should have done top coat to even it out because the texture of all that glitter was bumpier than I anticipated. Next time right? 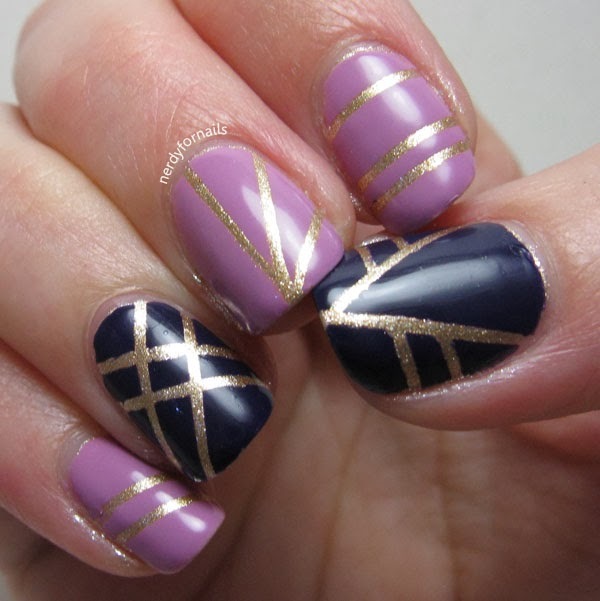 I used the brush from the bottle of Maybelline Color Show, Bold Gold to paint the tips and a striping brush to add the chevrons on top. It's all finished off with a coat of Sally Hansen, Dries Instantly. I'm finally starting to get in the Christmas spirit as much as possible for someone whose soul has been crushed by too many years in retail. I wanted to do something fun and simple since the holidays are such a busy time. I haven't had nearly enough time to paint the elaborate designs I'd like to do. These were fast to paint and came out really cute. I hand painted the french tips in white using the brush from my bottle of LA Colors white polish. 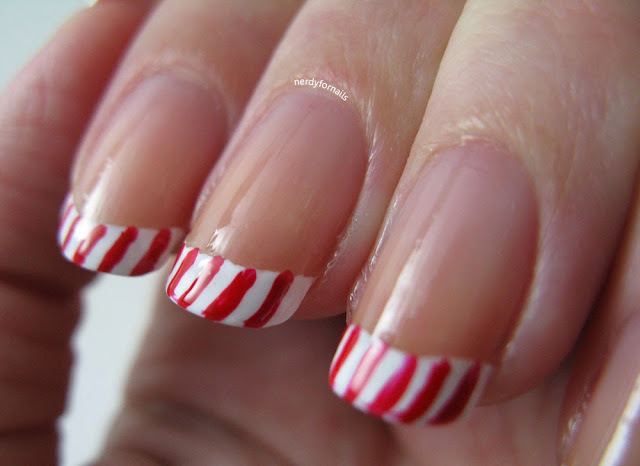 Next I used a tiny paint brush to add the red stripes and then top coat. What's this? Only three steps? Well, four if you count base coat. This may be the easiest thing I've done in months.